Although the cookie was introduced in America by Dutch settlers in the early seventeenth century, it wasn’t until the early 1900s, with the development of peanut butter, that the first recipe for peanut butter cookies first appeared. When the cotton crop was heavily damaged by the boll weevil, the now famous African-American botanist and agricultural educator George Washington Carver, promoted the peanut as a replacement crop. In 1916, Carver published a research bulletin called How to Grow the Peanut and 105 Ways of Preparing it for Human Consumption, in which he included three recipes for peanut cookies listing crushed or chopped peanuts as an ingredient. It wasn’t until the 1920s that peanut butter was first listed as an ingredient in cookies. Peanut butter’s beginning can be credited to a Canadian named Marcellus Gilmore Edson in 1884. Then in 1895, an American doctor in Battle Creek, Michigan, John Kellogg, was granted a patent for his method of making peanut butter, quickly followed by number of other inventors and entrepreneurs. By 1922, Joseph L. Rosefield had developed and patented the first method for a smooth-churned and shelf stable peanut butter. By 1928, his process had be adopted by Swift & Company, and the still popular Peter Pan brand was born, followed a few years later by Skippy, today’s leading peanut butter. It has been pointed out, on occasion, that you never can tell what on earth interests readers of this column and to what degree. With tongue in cheek, we stated recently that we had a file of letters marked Unanswered and Unanswerable. We quoted one of those letters, not fictional, in which someone asked if we could explain why peanut butter cookies were creased with a fork before baking. We didn’t really expect an answer to that, but replies we got. One reader wrote as follows: The cookies are creased with a fork, she informed us, to make them crisper. “One of my sons,” she continued, “once answered this technique and baked one pan of cookies plain, the other with the traditional fork creases on top. The plain peanut butter cookies did not taste as good and seemed a bit soggy in the center. “Since the peanut butter cookie dough is quite rich, I think the fork creases expose just enough dough to add a bit more crispy crust for better results. Another reader offered this conjecture: “Most cookies dropped by rounded teaspoonsful will flatten in the oven and bake evenly. Is there something in peanut butter cookie dough that prevents it from flattening out by itself? The peanut butter, for example? Pressing the dollop with the tines of a fork would assure the dough flattens properly and, therefore, bakes evenly.” But the explanation about pressing those cookies that we like best came from Sylvia Lavietes of New Haven, Conn.: “Your column today contained an inquiry regarding peanut butter cookies. Well, a stupid question calls for a stupid answer. 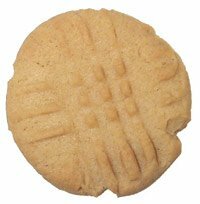 Peanut butter cookies are crisscrossed in order to make it possible to distinguish them from chocolate chip cookies in the cookie jar.